Have you ever gotten stuck in a crowded room and had to uncomfortably share half of your seat with someone else? Drawing inspiration from these awkward experiences, Pratt student Charlotte Kreitmann came up with an ingenious transforming chair design that won Inhabitat’s Best Student Design award last weekend at BKLYN Designs. Her design, dubbed Schair, is made of reclaimed wood turns from a chair into a loveseat and is the perfect solution for one person or two! Kreitmann is a recent graduate of the Pratt Institute Industrial design program. The program presents “a problem-solving methodology based on a heightened awareness of human activities, human perception, and the role these play in defining our culture through the forms and products of our daily lives.” While Kreitmann was studying in Germany, she found herself in a packed lecture hall uncomfortably sharing her seat with a fellow classmate – it was right then and there that the idea for Schair was realized. 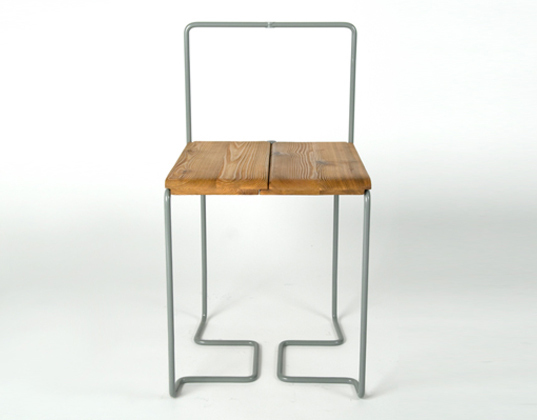 Schair’s seat is made of a plank of reclaimed wood that is divided in half so that each side can pivot outward. The structure is constructed with powder-coated steel rods and was fabricated with the help of Paul Crotty. When Schair is closed, the seat is a comfortable option for one person. When unfolded, Schair is split in half and rotated to form a small bench fit for two. The original chair back becomes an arm rest or a place to hang an umbrella, purse or coat. If you like Schair, don’t forget to check out the rest of our BKLYN Designs 2010 coverage here! This is fairly brilliant. I love it. You could even design covers and cushions to go with it!